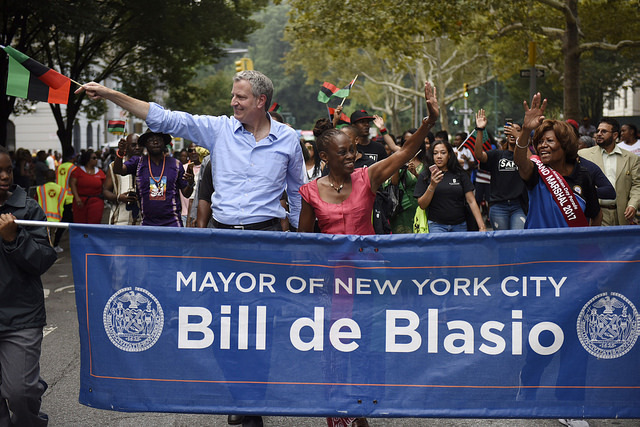 As Mayor Bill de Blasio, a first-term Democrat, seeks reelection this fall, a close examination of his record is essential. De Blasio came into power promising to address inequlality in a variety of forms, including income, educational, policing, racial, and opportunity inequities he identified during his 2013 campaign. In this year's election de Blasio is running in part on his record, which is headlined by the implementation of his campaign promise to provide universal pre-kindergarten for the city's four-year-olds. But, there is much more to the mayor's record than UPK, which has clearly been his biggest success. In this series, Gotham Gazette, with election coverage partners City Limits and WNYC radio, examines de Blasio's record on a variety of important issues. While this is not completely exhaustive, it should be helpful to voters and others seeking to evaluate de Blasio this fall. With our partners, Gotham Gazette will release articles and audio pieces on the following aspects of de Blasio's record -- those already published are linked below. Election Day is Tuesday, November 7. This article is part of a series on Mayor de Blasio's first term record as he seeks reelection this fall, in partnership with WNYC radio and City Limits. Find all pieces of the series here. In the four years since Mayor Bill de Blasio took office with the mantra of fighting the unequal “tale of two cities,” New Yorkers have seen wages rise and unemployment fall. De Blasio is currently presiding over a continuation of the longest economic expansion in the city’s history, and has used the strength of that growth to implement policies aimed at reducing inequality, largely by increasing the size and scope of city government. But, for many, affordable housing and other aspects of a good quality of life remain beyond the reach of their means, homelessness is hovering near record highs, and the haves and have-nots remain nearly as far apart as they were under the previous administration, at least in terms of income. As the Democratic mayor seeks another term, with a recently-unveiled middle-class jobs plans, he is touting his record on the economy and promising to use city policy to spur over ten years the creation of 100,000 jobs that pay at least $50,000 annually. There are questions, however, about the degree to which the progressive mayor deserves credit for the city’s continued overall economic boom and to what extent de Blasio has really shrunk economic inequality beyond simply income. 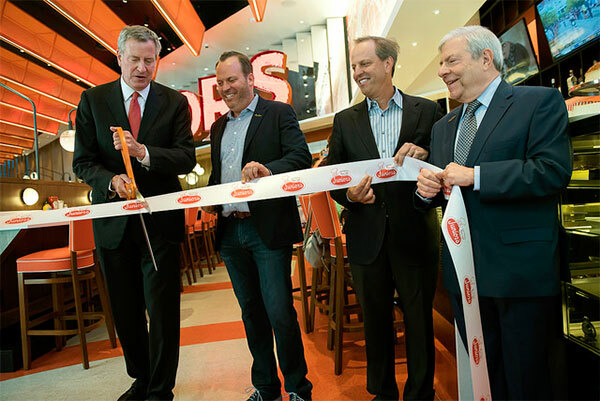 And, to some, de Blasio is seen as a mayor who has been more focused on new mandates on businesses than he has been on helping businesses grow, though most experts agree that de Blasio has not stifled business growth or repelled businesses. Meanwhile, unlike his predecessor, billionaire business executive Michael Bloomberg, de Blasio has not had to confront a major economic crisis (Bloomberg shepherded the city through two economic catastrophes, post-September 11, 2001 and the Great Recession that began in 2008). The de Blasio administration has been fortunate to avoid economic stressors that would truncate its ability to spend lavishly on its progressive priorities and force the mayor who likes big government to slash from the budget and workforce, though that could change in a potential second term as a widely-expected slowdown begins to take effect and federal policies threaten to wreak havoc on the local economy. 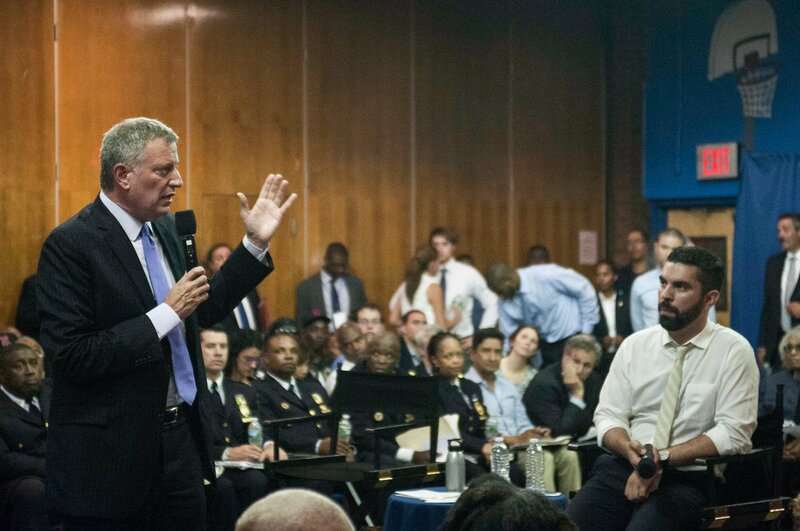 As of now, though, de Blasio appears to be taking a few more cautious steps, instituting a partial hiring freeze for city agencies, for example. He’s also been able to build reserves while quickly increasing city spending, and he’s now more focused on spurring private-sector job growth using the levers of city government. At his January 1, 2014 inauguration, de Blasio took “dead aim at the tale of two cities” and announced a slew of policy priorities that would help create “one city,” including the expansion of paid sick leave, curtailing stop-and-frisk policing, creating more affordable housing, and taxing the rich to fund universal pre-kindergarten. Just over three years later, at his fourth State of the City address, on February 13, 2017, the mayor’s aim was more pointed, and his rhetoric more humble. Acknowledging that the city’s prosperity was not felt by all its residents, he said, “Everything we've been doing so far is necessary. I believe it's right. But it's not sufficient.” Having touted his administration’s affordable housing efforts, he said, “We have to now focus on the other half of the equation. We have to drive up incomes.” And he announced a goal of creating the 100,000 new “good-paying” jobs in rapidly growing sectors of the economy by using the levers of city government. Indeed, part of the large public-sector job growth under de Blasio has been the addition of 1,300 NYPD officers, which serve the dual purpose of creating more middle-class jobs and, more significantly, helping to implement a neighborhood policing program and other measures that de Blasio and NYPD officials credit with further reductions in most major crime categories. The city’s economic health has also allowed de Blasio to successfully defend his approach to governance and his progressive policies. The doom-and-gloom forecasts of his detractors have not come to pass, and he has continued to argue triumphantly that building a more equitable city does not come at a cost to its wealthier residents. While de Blasio continues to call for higher taxes on the biggest earners, he does not control those policies, and though they may not care for his rhetoric, CEOs and top earners on Wall Street, in law firms, and elsewhere, appear fairly at ease given how safe the city is, the record tourism the city has seen, and the continued diversification of the economy. On most major economic indicators, the city is performing well, and better than national averages. As of September 27, according to data from the federal Bureau of Labor Statistics, there were about 4.4 million jobs in the city as of August, the highest number ever and up from 4.05 million in December 2013, just before de Blasio took office. In September, the unemployment rate in the city was about 5.1 percent and has hovered close to that for months. The number of private sector jobs has grown about 9 percent in the last four years. The median family income rose about 5.2 percent from 2015 to 2016, to a high of $65,440 -- an overall increase of 9.5 percent from 2013 -- according to calculations of census data by James Parrott, director of economic and fiscal policy at the New School’s Center for New York City Affairs. Poverty also fell to 18.9 percent in 2016, from 20 percent the previous year, per Parrott’s analysis (That is one metric where the city was far worse than the national average, which was 14 percent in 2016). With the economy thriving, economic experts, on the right and left, and independent fiscal watchdogs are in broad agreement that de Blasio’s policies have encouraged, or at least not hampered, the conditions for growth, both in directly measurable actions and through overarching policies with indirect, less quantifiable effects. But, there is also consensus that the administration must meticulously guide the next phase of the city’s economic development and keep a vigilant eye on variables that could threaten the city’s economic health. The next tests for de Blasio will come as he moves his jobs plan ahead, how the city’s investments in certain places, like the Brooklyn Navy Yard, pan out, and whatever larger economic forces and policies out of Washington, D.C. may portend. It’s hard to attribute the sustained growth of the city’s economy to local factors. Macroeconomic cycles and variables, including federal policy, and national and global developments, play a broad role, and New York City has benefited from a variety of factors, while remaining a top city for the financial services sector, arts and culture, and tourism. The city has outperformed the state and the country in most aspects of economic development, showing a resiliency that other places have not. Steadily growing tax revenues allowed the de Blasio administration to focus right from the start on economic inequality, rather having to worry about broader economic development or recovery, although the mayor insists that fighting inequality and growing the economy go hand-in-hand. Giving New Yorkers more resources, whether through higher wages or greater savings or more paid sick days, for instance, are better for productivity, he has often said. “While I certainly wouldn’t claim that the continued economic growth we’ve seen in the city is solely the product of policy decisions made by this administration, I think there are a lot of things that we have done over the last four years and that we have in the works that I think have promoted not just a continued strong economy but more inclusive growth,” said Anthony Hogrebe, a spokesperson for the New York City Economic Development Corporation, in a phone interview. The mayor has had such strong revenue at his disposal that he has been able to build the city’s reserves while rapidly growing the budget to implement policies to drive up wages and increase fairness and opportunity, especially for low-income families. The city’s annual expense budget has grown about 18 percent during de Blasio’s term, to $85 billion this fiscal year. He pushed for funding for universal pre-kindergarten, which the state largely provided in lieu of the mayor’s proposed tax on wealthy New Yorkers. The policy has saved families about $1.4 billion, according to city estimates. De Blasio also signed into law in 2014 an expansion of paid sick leave to 500,000 workers across the private and nonprofit sectors. Last year, de Blasio announced a $15 minimum wage by the end of 2018 for all city employees and workers at human services nonprofits contracted by the city. His efforts helped push the state toward increasing the minimum wage for virtually all employees in all sectors, to $15 in New York City by 2019. Parrott said the mayor has effectively controlled “policy levers” such as managing the city budget to invest in human services, infrastructure, and affordable housing, while also reducing crime to historic levels, all of which have been conducive to economic growth. “I think that overall responsible fiscal management approach has helped communicate confidence to the business sector in New York City,” he said, adding particular praise for how the mayor has built up the city’s reserves. The move reaffirmed the importance of collective bargaining, Parrott said, and provided thousands of city workers with wage increases while creating significant healthcare savings for the first time. While some say it did not do enough to reform health care obligations or anything to reduce pension obligations, the settling of labor contracts eliminated a major point of uncertainty for the city and the workers involved, and the salary boosts help to lift or maintain middle-class lifestyles for many civil servants. “I think overall he’s done a very good job,” Parrott said. Leaders of the city’s corporate business community have said that while they don’t necessarily appreciate the ways in which de Blasio talks about the wealthy not paying their fair share and his calls for higher taxes -- some see him as vilifying success and fostering class warfare -- he has not done much to get in the way of their priorities and he has even accomplished a few things they like, including parts of his education agenda and his choices in police commissioners. After the global recession that began in 2008, New York City saw a far quicker overall recovery than most of the country. The economy also increasingly diversified, with expanded growth outside of the financial sector, in retail, tourism, and tech, for instance. But job growth was mostly either in high-income jobs or low-income ones, with the lower end accounting for a majority. Middle-income jobs failed to materialize at the same rate. De Blasio took stock of this as his term wore on, and announced earlier this year “New York Works,” his plan to create over ten years 100,000 jobs that pay at least $50,000 a year. The goal has been panned as lacking in ambition -- the city’s economy has been creating on average 90,000 jobs each year (of any wage level) and extends well beyond a potential second term for de Blasio -- but it aims to leverage the city’s investments and regulatory authority to directly benefit sectors that are expected to grow or have good potential for growth with a boost from targeted city help. De Blasio and his team stress that the number indicates only jobs that will result from direct city action, not that would have been generated anyway, though it may not always be easy to differentiate. The mayor has already inaugurated initiatives and announced investments that dovetail with the jobs plan, including $442 million in infrastructure spending for city-owned industrial spaces such as the Brooklyn Navy Yard, the Brooklyn Army Terminal, and Hunts Point; a $5-million grant to BioLabs@NYULangone to create a life sciences incubator by the end of 2017; an $81-million Computer Science For All public-private initiative that is meant to build tech talent through public schools; and a $20 million program, announced on Monday, to double by 2022 the number of CUNY students graduating each year with a tech-related bachelor’s degree. At a recent discussion hosted at The New School by the Center for an Urban Future, Deputy Mayor for Housing and Economic Development Alicia Glen emphasized the all-encompassing nature of the jobs plan and the creation of an ecosystem that will support new job creation. “It’s really important to remember there’s a short game here and a long game and we have to play both of them,” she said. There was near unanimous agreement by an expert panel that followed Glen’s speech that the mayor’s plan to incentivize jobs would be incomplete unless accompanied by workforce development programs and with the requisite educational achievement that will qualify New York City residents for those jobs. The experts who spoke with Gotham Gazette concurred. “If Amazon doesn’t come here, that’s gonna be a big reason,” said Bowles, warning of the dearth of necessary skills and education for those jobs in New York as well as the dangers that increasing automation will bring to the same industries the city is targeting in its plan. “I don’t think we can go another four years without also doing some very specific things to curate the city’s economic growth,” he said, mentioning the need to help small businesses. Bowles praised the mayor’s focus on middle class jobs, as well as the city’s increased focus on promoting minority- and women-owned businesses. Laymon pointed out that a key budgetary recommendation of Career Pathways was to fund $60 million in annual “bridge programs” by 2020 to help people with limited educational attainment to receive additional skills training. Three years into the plan, the Fiscal Year 2018 budget includes a little over $6 million for those programs. “There has been some starting but it’s not moving fast enough to make some real substantial differences in the lives of New Yorkers,” Laymon said. “New York is a great place to live right now if you have a college degree or in-demand skills in a particular field or trade,” he added. But the struggle, he said, is for people who lack those skills and are dealing with an economy that is expensive and does not provide opportunities much better than four years ago, or before that. Angelina Garneva, communications director at NYCETC, added, “What we’ve been arguing for is that whenever there are conversations about economic development, workforce development should inherently be part of that conversation rather than an addendum or an afterthought or a wholly separate conversation.” She said the city needs to create an ecosystem for growth beyond only direct financial incentives, which administration officials have readily acknowledged. For instance, creating a system of collaboration between different workforce development programs and organizations. EDC’s Hogrebe said the 100,000 jobs plan accounts for workforce development. “Built into that I think is a very strong recognition of the need to create a pipeline to the jobs that we are looking to build and a strong commitment to doing so and looking at innovative models of apprenticeships and other types of programming that can actually create that pipeline,” he said. As evidenced by the jobs plan, the de Blasio-Glen approach is interventionist, both on housing and jobs, to harness and encourage market forces to benefit more New Yorkers. On both fronts, though, there are questions about whether the administration is reaching those struggling the most -- the lowest-income tenants looking for an affordable apartment, the unskilled young adult seeking a good-paying job. There are, of course, factors out of the mayor’s control that can limit growth and pose dire challenges for the city’s path ahead, which may include a second term for de Blasio. There’s broad consensus that federal policies -- on immigration, health care, taxes, and more -- can have devastating effects for the city’s economy through numerous direct and indirect ways. More locally, the city’s infrastructure issues and continued unaffordability for many can also serve to dampen people’s willingness to move, live, or open a business here, experts say. All that combined with an expected slowdown of the economy, after an unprecedented period of growth, could mean a perfect storm of economic uncertainty. “The economy goes in cycles and there’s no question it’s not going to keep clicking on all cylinders, without some careful attention and support from City Hall,” said Bowles of Center for an Urban Future. “I think in the next four years, we’re going to need to see more focus on economic development. I think that there’s a good chance the economy will slow down.” He pointed to decreasing retail jobs from the last few years as one warning sign. But the bigger issues, he said, are the ones that affect people’s quality of life and therefore the city’s ability to attract talent. Mounting subway delays and the increasingly high cost of living, he said, could have an impact. And President Trump’s immigration policies could hurt the city further. Recent studies have shown that international tourism to the United States has already declined, although not definitively linked to the Trump administration. According to the U.S. Department of Commerce, in the first three months of 2017, there were about 700,000 fewer international arrivals compared to 2016. Tourism has been a particular boon for the city’s economy, accounting for billions in spending. A record 60.5 million tourists visited the city in 2016, a statistic de Blasio frequently cites. About 12.7 million of those were international visitors. “It’s really about the confluence of what happens with the economy and with federal policy and then what is the city’s ability to manage that within the budget,” said CBC’s Doulis. She warned of the direct effects that federal cuts to Medicaid would have on the city, something the state and city governments are already feuding over. She pointed to President Trump’s tax plan, including the proposed elimination of the state and local tax deduction, on which high-tax states like New York rely. Although Doulis acknowledged that the city has built up strong reserves to deal with a slowdown, or even a downturn, she said there hasn’t been sufficient “belt-tightening” at city agencies. The mayor’s response in such a situation is also hard to predict, she said. Would he propose more taxes or take a more balanced approach? “That’s an open question, and it’s likely to be one the mayor’s gonna face in the second term,” she said. Gelinas, from the Manhattan Institute, wasn’t very concerned about Trump’s proposals, mostly since she doesn’t expect them to be enacted. She noted, for instance, the numerous failed attempts to repeal and replace the Affordable Care Act. “I think one of the challenges in a slowdown would be, can the city maintain its quality of life if it loses a few billion dollars in tax revenue in any one year,” Gelinas said. “If people see that public services are slipping, they may not want to commit to being in New York.” She did, however, say that a market adjustment would be good for the city if it meant a decline in office and residential rents and property prices, allowing businesses and people to move here who couldn’t afford it otherwise. “Being too successful all the time is not that good either. We may be pushing out people to cheaper places that want to be in the arts or creative industries and that’s not good for the city in the long term,” Gelinas said. And Parrott praised the mayor’s management of the budget and reserves, which he believes will sustain the city through a period of weakened tax revenues. “There’s nothing in Bill de Blasio’s management of the budget to suggest that he’d be any less capable in approaching that,” he said, expressing an opinion not especially common among analysts of de Blasio’s leadership. There are also fiscal crises happening simultaneously at the city's public housing authority, NYCHA, and its public hospitals system, Health + Hospitals, where turnaround plans are in place, but need is dire and federal help vanishing. Cyber security is one plank in the mayor’s ten-year job creation plan, which he announced from the sleek Garment District offices of SecurityScorecard, a firm specializing in cyber security monitoring and threat detection. Cyber security has been identified as a growth sector, one that will be home to more jobs if the city helps spur it along, the mayor explained. The overall jobs plan, largely put together by Deputy Mayor for Housing and Economic Development Alicia Glen, promises 100,000 jobs with “good wages” – defined as an annual salary of at least $50,000, which the mayor admitted was somewhat an arbitrary number – through 25 initiatives. Ultimately, the proposal was framed as a way to create a “critical mass” of tech innovation, as the mayor put it, and ensure New Yorkers enter into fields allowing them to live in the city without being “rent-burdened” – spending more than 30 percent of one’s income on rent. The jobs plan is the other side of the coin to the mayor’s 200,000-unit affordable housing plan, which he and Glen unveiled in 2014; both of which attack the city’s affordability crisis and the inequality that the mayor promised to address as a candidate. During the announcement and the press questioning that followed, de Blasio and Glen repeatedly stressed that the plan’s purpose was to create “jobs that would not be created otherwise” as opposed to riding the wave of growing industries and claiming credit. Glen, who said she had spent time studying other jobs plans at the municipal, state, and federal level, derided them as “usually about positioning yourself to take credit for a lot of different things that are going on in the economy already,” but insisted that this plan would supercede those by having a “quality screen” to the jobs. She said that only jobs that could be directly traced to the administration’s efforts would be counted towards the stated job-creation goal, though the exact criteria that would be used was not made clear. The administration committed to providing yearly progress reports. The mayor also couched the proposal as part of what he called a “high investment model of government,” and characterized the proposals -- a variety of city efforts including new uses of city land, workforce development, deal-brokering, and more -- as “investment,” with job gains the expected return. “Private sector folks do key off of government signals, and government actions, and government investments,” he said, and alluded to conversations with tech leaders in which an obstacle had been “a certain amount of lack of cognition on how to get started in New York.” He argued that the investments would demonstrate to job-creators that New York City was serious about accepting their business. The initiatives are subdivided into five areas: tech – the largest, with 30,000 projected jobs; life sciences and healthcare (15,000 projected jobs); industrial and manufacturing (20,000 projected jobs); creative and cultural sectors (10,000 projected jobs); and, the especially and purposefully vague “space for jobs of the future” (25,000 projected jobs). The job targets are further broken down into particular projects, in what Economic Development Corporation President James Patchett called a “framework” that would be adjusted depending on changing industries and sectors. Patchett’s job includes shepherding the plan, adjusting its pieces, and meeting the targets. The job-creation plan comes at a time when the city’s unemployment rate has hovered at around 4 percent, a modern record-low and fact that has been routinely emphasized by the mayor. But, de Blasio explained the need to create jobs with good wages and long-term career options, allowing the city to “shape our own destiny” and lift more New Yorkers out of poverty. After serving jail time in 2014, Anthony McGlashan, a resident of East New York, Brooklyn, struggled to find employment for three years. While he had a certification from the Anthem Institute in the field of Information Technology, he continued to be rejected by employers due to his lack of experience and his criminal background. McGlashan then turned to one of New York City’s Workforce1 Centers, a city initiative that provides free career services by pairing employers with workers, holding workshops for resume and interview preparation, and other resources to aid the job search. In August 2015, McGlashan enrolled in Employment Works, a city program designed to match individuals with criminal histories with full-time, permanent positions in an attempt to reduce recidivism. Through workshops and the support of the program, McGlashan was able to secure an IT support position with the State of New York Unified Court System. Those previously involved with the criminal justice system often face significant difficulties when looking for permanent job opportunities. Despite serving their time, a criminal history makes employees much less likely to be hired. To eliminate this type of employment discrimination by employers, New York City passed the Fair Chance Act in October of 2015, forbidding employers from asking for the criminal records of job applicants until a job offer has been made. To help further break down barriers faced when looking for a job after a conviction, Mayor Bill de Blasio, working with City Council Member Rafael Espinal and Commissioner Gregg Bishop of the Department of Small Business Services (SBS), is opening a new Workforce1 center in East New York, Brooklyn on Monday. The center, part of the East New York Neighborhood Plan that was negotiated by Espinal and the de Blasio administration and passed through the City Council, is tailored to the specific needs of this neighborhood. East New York has a high percentage of out-of-work, out-of-school youth and individuals with criminal backgrounds, according to the city. As part of the East New York rezoning that passed earlier this year, the career center is the nineteenth such center across the city. It will cost about $700,000 annually to run, according to SBS, with that money coming through a federal Workforce Innovation and Opportunity Act grant. The funding for creating the facility, about $165,000, came from the $276 million allocated for community development in the East New York plan, which encompasses a key stretch of Espinal’s district that will soon be home to new housing, retail, and other development, along with other community services, like a new school. It is an underdeveloped area with high concentrations of poverty and the first neighborhood rezoned under the de Blasio affordable housing plan. Some of the debate centered on the East New York plan -- and other rezonings being considered around the city -- revolved around the levels of affordability for new rent-stabilized housing in the rezoned area. New housing in East New York will be deeply subsidized by the city, but there are still concerns of displacement. 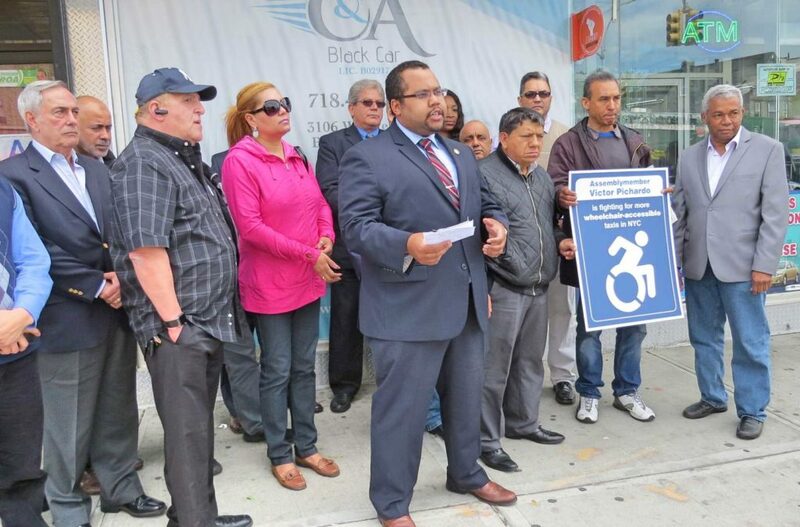 Relatedly, Espinal and others rallied on Saturday against predatory homeowner speculation that has been occurring in the area in anticipation of community improvements and rising property value. Alex Vitale, a Brooklyn College sociology professor, said opening this career center in East New York reflects the mayor’s understanding of the biggest challenge facing young people of color: unemployment. “High levels of joblessness among these young people is a major contribution to participation in underground economies of drug dealing, property crime, and prostitution,” Vitale said in an email. While these centers provide job-searching resources, Vitale said the mayor should continue to identify more ways for unemployed youth to get jobs, increasing public and private sector opportunity. According to the city, the new East New York center includes partnerships with community-based organizations. Espinal points out that while the unemployment rate continues to drop nationally, it has remained higher in Brooklyn, and it is even higher in East New York. Note: details of the funding for the career center have been clarified from the original version of this article. For almost two million New Yorkers, the Fair Chance Act, a city law passed one year ago, represents opportunity. The law helps level the playing field during the job application process for the nearly one in three city adults with an arrest or conviction record. For people attempting to support their families after an encounter with the criminal justice system, moving on isn’t easy. The stigma of a record can follow someone for a lifetime, casting a shadow that obscures the applicant’s skills in the eyes of potential employers. When employers inquire about arrest and conviction records up front, those applications with the box checked—indicating “yes, I have a record”—frequently end up in the trash. Applicants who check the box are half as likely to get a callback as those who don’t—one-third as likely if the applicant is black. After Brooklyn native Jason Grant left prison, he checked the box on lots of job applications. He didn’t receive callbacks. “It was definitely frustrating,” he says. For over a year, he got only construction gigs—one of a few industries historically more open to hiring workers with records. The work was intermittent and took a toll on his body. Long periods between jobs made it nearly impossible to provide for his son. This year, things changed for Jason and millions of New Yorkers. Thanks to the Fair Chance Act, the conviction-record checkbox on job applications is gone. In other words, the city “banned the box.” All public and private sector employers must now postpone any record inquiries until the final stages of the hiring process—after they have extended a conditional job offer. Referred to collectively as fair-chance hiring, these safeguards were born out of state and federal anti-discrimination law. After the Fair Chance Act, Jason found a stable job that he loves at Architectural Grille, a modern manufacturing plant specializing in metal products. “I like challenges...I get to learn something new. These are million dollar, intricate, complex machines,” Jason said. Fred D’Antoni, who found Jason through the Center for Employment Opportunities, says hiring Jason was a good choice. “He was just so motivated and thankful for the opportunity...Such great potential.” And he says his experiences hiring other workers with records have been similarly positive. Jason realizes he is lucky. Nearly one in three American adults—disproportionately people of color—has an arrest or conviction record, and many must still check the box when they apply for a job. But the tides are changing. New York is one of 14 cities and counties (and nine states) to have banned the box for all employers. The District of Columbia adopted a fair-chance law in 2014 and has since hired 33 percent more people with records. After Richmond, Virginia banned the box in 2013, approximately one in four people eligible for city hire had a record—and most got a job. Despite positive gains, opponents cite two recent studies criticizing ban-the-box. They say the policies result in increased discrimination against applicants of color because employers assume they are likely to have a record. But as one economist noted, the studies are unconvincing. The results actually demonstrate increased hiring and callbacks for most people with records. Where gains are flat for young men of color, the studies show that racial discrimination in hiring is deeply entrenched. Instead of undoing a policy that works, we should strengthen it with a full jobs agenda and targeted anti-discrimination efforts to address these biases. In the end, the data is only one part of the story. For workers like Jason, stable employment can be the difference between making it or not after contact with the justice system. Having a place to live, supporting your family, a sense of purpose—these all flow from a job. 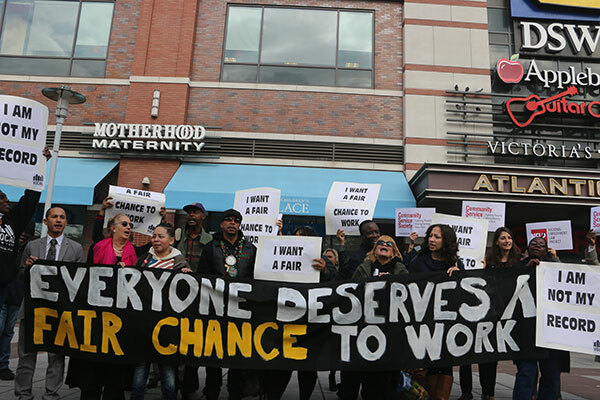 The Fair Chance Act is changing lives for the better, and New Yorkers—both employers and employees—should be proud to have one of the strongest fair-chance laws in the nation. Beth Avery is a staff attorney at the National Employment Law Project (NELP) and works to promote fair-chance employment and opportunities for workers with records across the nation. Starting one’s adult life in poverty and without a job has serious long-term economic consequences that negatively impact future job prospects, earnings, and wealth. Young people are scaling one of the toughest jobs cliffs in recent memory, and the situation is a looming threat to economic growth in our state. We need to combat New York’s young adult unemployment crisis with a robust strategy, and now. One analysis found that a young person who is unemployed for six months can expect to earn $22,000 less over a ten year period. Here in New York, more than 400,000 unemployed 16-to-24-year-olds are looking for work. This could lead to a potential loss of about $8.8 billion in earnings to young adult New Yorkers over the course of the next decade. According to the 2015 American Community Survey, New York’s young adult unemployment rate is 15 percent, and for young adult New Yorkers of color, it can be as high as 25 percent. That’s more than 10 and 20 percentage points higher than older adults, respectively. Relatedly, more than 13 percent of 16-to-24 year olds in New York are out of school and out of work altogether. On top of high unemployment, the state’s young adult poverty rate is 22 percent, 10 percentage points higher than for older adults. High unemployment only exacerbates growing economic inequality. Wages and incomes already stand at lower levels for this generation than older generations when they were young adults. Worse, today’s job market increasingly requires a postsecondary credential or qualification, and along with it, the possibility of student debt. By 2018, at least 62 percent of jobs will require some college, 28 percent of jobs will require only a high school credential, and just 10 percent of jobs won’t require a high school credential. For the most disadvantaged and disconnected young adult New Yorkers, this puts access to a decent job—and with it a financially secure life—even further out of reach, threatening our state’s economic security and shared prosperity. Unfortunately, despite the unmet demand for a trained workforce and high young adult unemployment, a real statewide youth jobs strategy is missing. Young Invincibles, the youth advocacy organization for which I am Northeast Director, is releasing a report in the coming weeks analyzing the Urban Youth Jobs Program. The program currently represents the state’s single largest youth jobs investment in New York State, authorized to spend $50 million annually. Our report finds that despite this massive investment, the tax credit program inadequately addresses the need to develop the skills of young adults that would better connect them to meaningful careers. That’s why Young Invincibles, along with more than a dozen other partners across the state, is calling on the Labor Committees of the New York State Assembly and Senate to hold a joint public hearing to review the Urban Youth Jobs Program and begin the public policy process to develop a real young adult jobs strategy. There are proven, evidence-based solutions to these issues, but like with any adversity, we must have the political will to tackle our challenges head on and embrace those answers. A public hearing is one way we can start needed conversation about how to respond to the modern-day economic challenges young adult New Yorkers face. Kevin Stump is the Northeast Director for Young Invincibles, an advocacy and policy organization working on higher education, health, and jobs issues impacting 18-34 year olds. YI is also a part of President Obama's College Promise Task Force. On Twitter @KevinStump and @YoungInvincible. New York City is, and always will be, one of the world’s economic powerhouses. Yet that doesn’t mean there isn’t room for improvement. In fact, although unemployment across the city has fallen faster than the rest of the country since the recent recession, areas like the Bronx still lag. While the Bronx has seen some progress, there is still much work to be done for shared prosperity and economic opportunity for all. With the right tools and policies focused on entrepreneurial growth, the most impoverished borough can have the opportunity to complete the city’s economic boom and ensure that the entire city, not just the lower half of Manhattan and a few other areas, experiences long-lasting economic growth. New York City’s resilience was again proven by an impressive return to economic prosperity after the recent worldwide recession. Although it’s near 5 percent overall unemployment rate may make much of the rest of the country envious, the Bronx continues to have a rate above 7.5 percent, more than 50 percent higher, while the 1.5 million Hispanics in the borough also make up a majority of its unemployed. Hispanics in New York City total nearly 2.5 million people; alone they would be the fourth-largest and one of the fastest growing cities in the country. Even while Hispanics still constitute a disproportionate amount of the unemployed, also losing more of their wealth than any other demographic during the recession, Hispanic-owned businesses have proliferated across New York. In fact, new business growth in this demographic has increased at a rate of more than eight times the overall rate, simultaneously improving total payroll by 40 percent and revenue by almost 50 percent. Local representatives and appointed officials shouldn’t take these statistics lightly. While we’ve always known that something has to be done to improve economic outcomes in more disadvantaged areas such as much of the Bronx, what hasn’t always been clear is what will drive results. It should now be clear: the best opportunities for long-term growth reside in improving entrepreneurial opportunities. There is plenty of room for improvement. While the Governor Cuomo’s Unemployment StrikeForce is a great program to increase employment, New York City was recently ranked 145 of 150 U.S. cities for Hispanic entrepreneurs. More should be invested in creating entrepreneurial opportunities, while also ensuring that regulations don’t impede them. When asked, one of the greatest impediments to creating and growing a business is the lack of access to capital. Hispanics in particular receive funding at rates far lower than the rest of the population. In one recent study, it was found that across the country less than one percent of venture capital funding went to Hispanics. Grants and other creative funding opportunities should be pursued through both the private and public sectors, especially here in the New York City. While some ventures require significant capital to start, it should be noted that thousands of small business owners across the city continue to bootstrap their way to success. While few are lucky enough to get angel funding and share space with other like-minded entrepreneurs, many more start businesses selling products such as those offered by Herbalife, which focuses on expanding its line of nutrition products and is especially popular in the Hispanic community. With little up front capital, these “micro-entrepreneurs” are creating additional income for their families that is otherwise hard to obtain. When considering easing the burden of the city’s bureaucracy, officials should realize that many of these smaller startups might not find it worthwhile to take the time – and pay the fees – to navigate the existing regulatory process. Although tempting to focus on the direct revenues gained from complying with existing regulations, if we have to choose between a profitable, tax-generating, employee-paying business in operation versus an entrepreneur sitting on the sidelines, the former should always win. Incubators and accelerators are another alternative to promote economic development and are fast becoming the best way to improve the economy of a particular region, especially one that is currently plagued by poor economics. Thus far, few of these exist in areas outside of Manhattan. It’s not unreasonable to ask a municipality to get involved in the creation and development of a local accelerator; after all, the entire region benefits. Just ask 1776, which has incubated hundreds of local startups in Washington D.C. with a relatively small grant from the city and has begun expanding across the country, recently opening a branch in Brooklyn. New York should have similar success stories in every borough. Whether a future business mogul looking to get that tech startup on its feet or a local family just hoping to help make ends meet with income selling nutritional products within their neighborhood, one thing is certain: New York’s future resides in these entrepreneurs. Local appointed and elected officials should remember that New York City’s best chance to grow is through the expansion of new, and improvement of existing, entrepreneurial opportunities outside of lower Manhattan. Only then can we guarantee the successful future that New York has always promised. Assemblymember Victor M. Pichardo represents the 86th District in the New York State Assembly. Justin Vélez-Hagan is the executive director of the National Puerto Rican Chamber of Commerce and an economic policy researcher at the University of Maryland.